There is a lot of confusion about the meaning of this name. Remember, though, that it is just a common name, and nobody's really wrong or right. The most prominent and "correct" interpretation is that it refers to Nectopsyche caddisflies, but it is frequently applied to Ephoron mayflies (which are more often called White Flies) or even to whitish aquatic moths. Like most common names, "White Miller" can refer to more than one taxon. They're previewed below, along with 1 specimen. For more detail click through to the scientific names. These are pretty much always called White Millers. The common name White Miller is usually applied to this entire genus, although it was created for the very prolific species Nectopsyche albida. Some of the other species are darker-colored. Most of the adult activity, both emergence and egg-laying, takes place during the middle of the night. There is some rare overlap with the low-light hours of dusk and dawn, but this genus really belongs to the night fishermen. Nectopsyche (White Millers) Caddisfly Adult View 1 PicturesThis is Nectopsyche lahontensis. These are very rarely called White Millers. On certain rivers in late summer the Ephoron mayflies gives new meaning to the words "blizzard-like hatch," because their large white bodies give a true snowstorm appearance to their enveloping swarms. This is the most intense aquatic insect hatch of the year in places, and sometimes the flies are so thick that it's hard to get a trout to find one's imitation among the carpet of real insects on the water. Ephoron leukon is most important species in the East and Ephoron album in the West. They overlap in the Midwest. 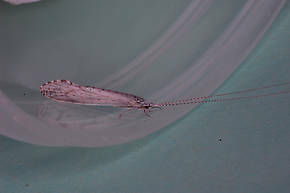 These are the only two mayflies of this genus recognized in the United States, but Caucci and Nastasi in Hatches II report inspecting specimens which did not fit the description of either species.